Do you believe in Champ? « To outline or not to outline…? 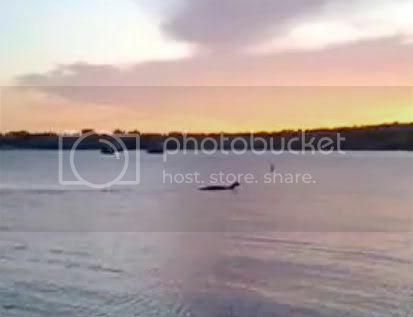 Big news from Lake Champlain this week… Our local media has picked up the story of a Vermont man who videotaped a mysterious-looking something apparently swimming in the lake near Burlington over the weekend. He shared the video to YouTube. Is it a really big dog? A deer? Could it be Champ, Lake Champlain’s resident monster? People are naturally skeptical, and at least one scientist has suggested that it actually looks like a moose in distress. I can’t say for sure what’s swimming through the water in this shot. But I can say that it’s very different from my own experience with the legendary Champlain monster. That’s right…I’ve seen the lake monster. I don’t talk about it much (because I’m afraid of getting those looks that I always used to give people who talked about seeing lake monsters). But the creature I saw was longer – probably 15-20 feet, with bumps along its back, and its head didn’t stick out of the water so much. I’ve seen it twice. The first time was late spring of 2003. I was making dinner, and my son called to me from the living room. "Mom…. What’s that?" He stared out the window, and when I saw what he was pointing at, I stared too. "Well…" About 60 yards offshore, I could see a series of small bumps in the water that stretched out for at least fifteen feet. And the whole thing was moving. Swimming. There was a small wake behind it. "Well," I said again. "I think…uh…." The thing turned in the water, and the bumps snaked around. It straightened out and swam a little closer to shore. "Well…I think that’s what people see when they say they see Champ." We rushed outside and stood on the seawall, watching it swim back and forth for at least five minutes. Then it sank below the surface and disappeared. About an hour later, my husband came home for dinner. "We saw Champ," my son told him. "Right…" No matter how many times we insisted it was true, he shook his head and laughed. Until the following week. "Hey, Kate?" he called from the living room window. "Is that what you saw the other night?" There it was again. This time, we all ran outside, along with a dozen people from the birthday party that was going on next door. The creature was just the same…bumps protruding from the water just a little…and easily 20 feet long. And then… a second creature appeared, looking just the same, but swimming in the opposite direction. They crossed paths, back and forth several times, and didn’t even seem to acknowledge one another. Were they feeding on a school of fish? What were they? No one left to get a video camera; we were sure they were about to disappear. But they stayed for another ten minutes, swimming back and forth. And then swam off. Were they lake creatures left over from centuries past? Was each long creature really just a few giant sturgeon, swimming in perfect single file? I don’t know. And part of me… likes not knowing. I love living here, for the mountains and cool still water, for the historical shipwrecks and musical waves. And for the mystery. I love that Lake Champlain still has some secrets she’s not giving up just yet. This entry was posted in Uncategorized and tagged champ, lake champlain, sea monster. Bookmark the permalink. Both comments and trackbacks are currently closed.